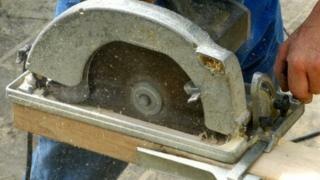 Police in Slovenia have accused a woman of cutting off her hand with a circular saw - with the help of her family - to make a fraudulent insurance claim. The 21-year-old and a relative have been detained and face up to eight years in prison if convicted. The suspects recently took out injury insurance, police say. The woman allegedly stood to gain about €400,000 (£340,000; $450,000) in compensation and monthly payments of about €3,000 from the policy. Four members of the family were initially detained earlier this year, but two were later released. Police say the group deliberately cut the woman's hand above the wrist at their home in the capital Ljubljana. Relatives took her to hospital, saying she had injured herself while sawing branches. Officials say the group left the severed hand behind rather than bring it to hospital, to ensure the disability was permanent. But the authorities recovered it in time to sew it back on.